TVS, maintaining its product expansion spree, has launched the new TVS Wego. The 110cc scooter first launched in 2009 has received a host of changes which should really help it maintain the stronghold it enjoyed in this segment where its primary competition – owing to similar specifications and pricing – would be Suzuki Let’s. Rs. 49,580 (Ex-showroom Mumbai) for the disc brake option. The Wego has always stood out because of its sharp designing backed by some great performance and efficiency, the 12-inch alloy-wheels, telescopic front suspension and the gas filled rear shock absorbers were signature features of this scooter, all of which by the way have been retained in the 2014 Wego. So moving on to what makes the New TVS Wego, new. The Wego’s new engine is the 110cc CVT-i engine, also used in the TVS jupiter. The all-Aluminium engine has a higher compression ratio and remapped ignition to help with easy cold starts and the revised ignition provides better combustion and hence better efficiency. There is a new piston used which gives us lesser friction as compared to the previous model. 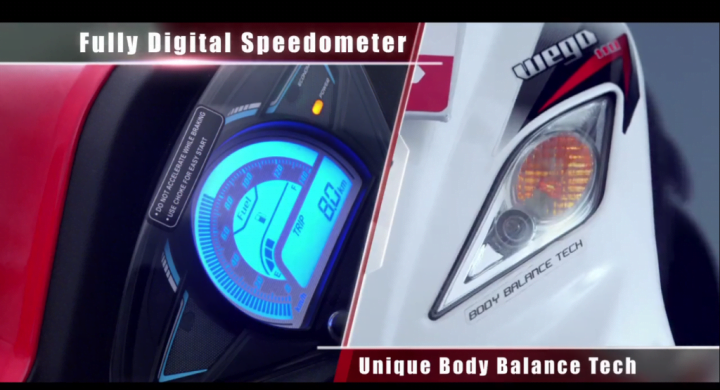 It provides you with peak power of 8 BHP @ 7500 rpm and 8 Nm of torque. Dual tones in white and red are also made available. Direct competition would be the Honda Activa- i, Suzuki Let’s and Yamaha Ray. TVS sure looks prepared to tackle them and the New TVS WEGO seems armed to impress and dominate. What are you thoughts on the New TVS WEGO, share with us in the comment section below.